A day in the life during Core. MIT’s motto “Mens et Manus” translates literally to “Mind and Hand.” The best way I can explain is to learn by doing (getting your hands dirty). Taking the theory and education you learned in the classroom and putting it to use in real-world environments. MIT Sloan offers many opportunities to do just that – most prominent among them are the Action Learning Labs. This philosophy is so integral in all that MIT does that you can find great examples of it all over MIT. I was able to appreciate that motto firsthand in a unique place: the MIT Sailing Pavilion. One of the perks of going to MIT is having access to the MIT Sailing Pavilion. Students, after taking just 2 sailing classes, obtain their sailing card and can take out a sailboat at any time on the Charles River. All of this is free and is only a short 5-10 minutes from MIT Sloan. As soon as I got my MIT ID, I signed up for the sailing classes. 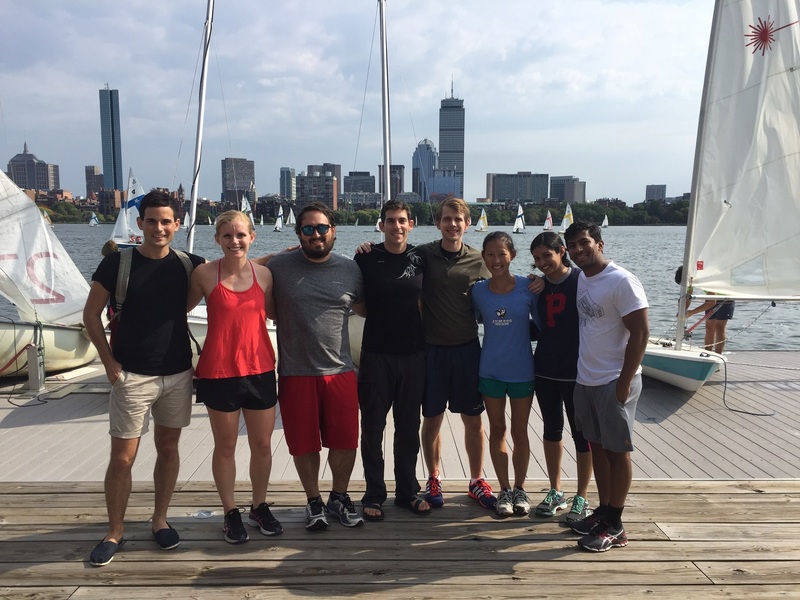 It was something that I learned about during Admit Weekend and I had put learning to sail on my list of things I wanted to accomplish during my time at Sloan. The classes are taught under supervision of multiple experienced sailors who walk you through the whole process: rigging the boat (preparing the boat for launch), operation of the boat while on the water, and de-rigging the boat. I came home after those two classes thinking: Awesome! I know how to sail! I did just that. I went back to the Pavilion and talked with a staff member and asked for his help. His reply was to “just give a try and see what happens. Come back when you’ve completed your rigging and I’ll check it over and provide feedback.” I gave it a try and I was dreadful. After 40 minutes of fiddling with the ropes and looking up instructions on my phone, I eventually put together something resembling a sailboat. I asked the staff member to come check it out and he found many errors. He showed me what I did wrong and I made a mental note of it. Next time I’m going to nail this rigging thing! Next time: still a dreadful mess. This time I forgot to put the plug in the boat. I pushed the boat in the water and stepped aboard. The boat immediately started filling with water. Ahhhh!!! Lesson learned: The plug is very important. I won’t forget that again. The next time out went a little better. And the time after that a little bit better still. Through experience, I was gradually learning the dos and don’ts of rigging the boat. When I’m not sailing, I’m reading instructions or watching videos on how to rig the boat or sail. My goal is to add a little bit more each time I go out. This experience has been the perfect metaphor and application of learning by doing. Don’t expect to be an expert on your first go round. Failure is a good thing. It teaches you what not to do and what areas to work on. So far, I have been sailing 8 times and the past two weekends, I have actually organized sailing groups of 10-15 people to go sailing on the Charles. I’m now the one showing the less experienced sailors how to do this or that and providing feedback on their mistakes. Translating this lesson to the classroom – one area in class that I want to work on is my public speaking skills and I plan to apply my lessons learned from sailing to public speaking. Based on my sailing experience, I need to just get out there and do it. Make mistakes. Get feedback. And learn from it. The only difference between me fresh out of my sailing class and now is a mere 8 sailing sessions and the growth has been tremendous. I am optimistic with the many public speaking opportunities I will partake in at Sloan that the difference between me now and me then will be just as tremendous. AdMIT weekend: coming a full circle!